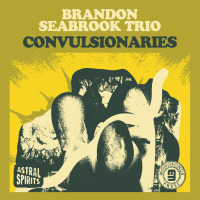 Guitarist Brandon Seabrook is one of the most imaginative six-string virtuosos currently operating in the fertile Brooklyn scene. His enviable talents have been featured in an eclectic variety of projects since the mid-1990s, including Beat Circus, Naftule's Dream and the Peter Evans Quartet, with an extremely percussive technique on tenor banjo adding further mystique to his idiosyncratic artistry. The shrewdly named Seabrook Power Plant is his flagship power trio, featuring his brother Jared Seabrook on drums and regular Evans' collaborator Tom Blancarte, on upright bass. 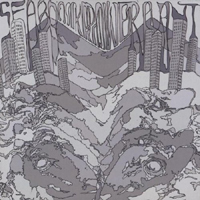 Eschewing stylistic limitations, the group's debut, Seabrook Power Plant (Loyal Label, 2009), merged unfettered avant-garde improvisation and prog rock complexity with the ferocity of punk and metalan approach pushed to even greater extremes on its sophomore sequel, Seabrook Power Plant II. 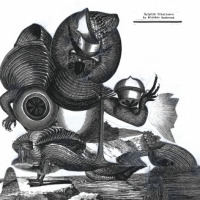 The unclassifiable opener, "Lamborghini Helicopter," immediately eradicates stylistic preconceptions, with a wholesale deconstruction of staid genre clichés. Guest artist Judith Berkson's operatic vocalese soars into uncharted territory at the bridge, navigating dissonant harmonic clusters, stop-start tempos and shifting time signatures wrought by a kaleidoscopic confabulation of blistering banjo arpeggios, machine gun-like percussion volleys and asymmetrical bass lines. Seabrook's unaccompanied banjo excursion, "Forcep Perception," ranges even further afield, evoking a futuristic Eurasian sound world culled from alternate tunings and a hyperactive tremolo attack. The trio reigns in some of the improvisational excesses of their first record with laser-tight group interplay and focused compositional rigora detail reinforced by layers of multi-tracked studio overdubs. Brimming with primal, fist-pumping attitude, brisk numbers like "Black Sheep Squadron" and "0515" seethe with punk rock fury and metallic precision, packing copious amounts of sonic information into concise running times. The album maintains a similar intensity level throughout the remainder of the session, expanding beyond endless salvos of punctilious aggression with interludes of cinematic impressionism and pan-ethnic experimentation. The episodic "Sacchetto Mal D'Aria" is emblematic of the ensemble's versatilitya stunning tour de force of subtle stylistic variations that careens through numerous changes, from exotic modal panoramas to heavy metal thunder. Clocking in at 37 minutes, Seabrook Power Plant II is a brief but thrilling ride. Although the iconic efforts of artists like The Minutemen, The Meat Puppets and Sun City Girls serve as touchstones for the band's aesthetic, Seabrook's singular vision bears no overt influence from these pioneers, other than their enthusiastic dedication to making visceral, uncompromising music on their own terms. In other words, Seabrook Power Plant II rocks. Track Listing: Lamborghini Helicopter; Black Sheep Squadron; The Night Shift; I'm Too Good For You; Kush Lamps Ablaze; Sacchetto Mal D'Aria; Forcep Perfection; 0515. 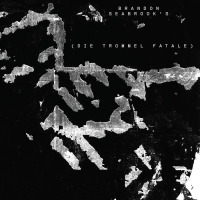 Personnel: Brandon Seabrook: banjo, guitar; Tom Blancarte: bass; Jared Seabrook: drums; Judith Berkson: voice (1).